In this Post Jim Brogden explains how to link multiple charts to a single drill down using Excel Lookups and Xcelsius 2008 chart drill down feature. 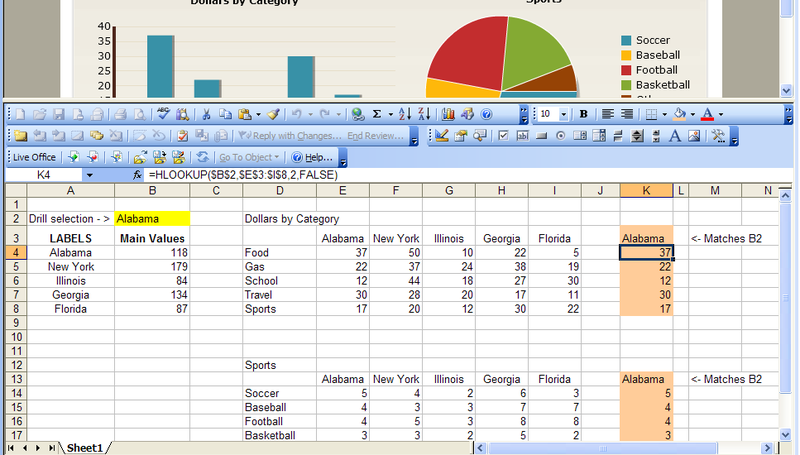 Use the Drill Down feature in combination with Excel logic to pass information from one chart to many others. Click here to see the Blown up version. 1. The first step is to either add a Column Chart to an existing Xcelsius model or edit an existing one, set the values and labels to populate the chart then select the Drill Down tab. 2. Check the ‘Enable Drill Down’ box and select Row as the Insertion Type. The Insertion Types available when enabling the Drill Down feature on a Column Chart are the following: Position, Value, Row, Column, Status List. The Position type returns the position in the order where the selected bar appears in the list. The Value type returns the value of the selected bar. This example will be using the Row type, which will return the label of the selected bar. 3. After selecting Row as the Insertion Type, point to the Source Data (the same as the charts Labels), and choose a Destination cell. This is an important cell because it will be used to identify values in the additional charts. Now that the drill-down selection is in the destination cell (B2 in this example), it will be used by a series of simple HLOOKUP formulas to identify the data associated with it to display in additional charts. 5. A second example is used that is very similar to the one above but the value is passed to cell K13 and additional HLOOKUPS are used to identify the correct values associated with K13. These values appear in cells K14:K18 and are used to create the pie chart. 6. The main chart can set a Default Selection (on the Drill Down tab in properties) which will be the subsequent drill-down value picked up by the additional charts. Feel free to send me an email if you have any questions. Thank you. 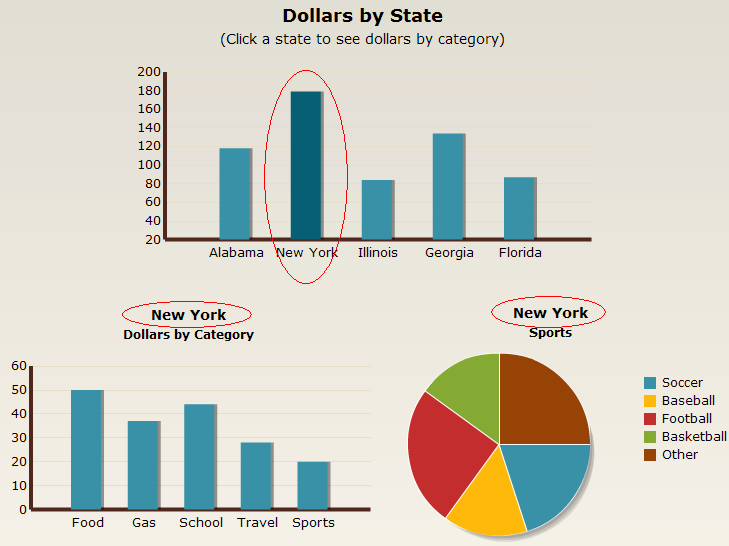 Posted in: Articles, Charts, Dashboards, Examples, MS Excel, Xcelsius 2008. Do you have the Xcelsius .xlf file for the drilldown. I am having with my drilldown data. Please see the data below. Click on DEF Row and it should show up Table 2. I am having hard time to get this work. Can you please give your input. I feel the example and design is good but it is not explained properly. the name of the state and putting it in B2. Then how the other stuff is working. I placed HLookup formula in K4 and once state in B2 changes it changes the value accordingly. My question is how the correct values of Food, Gas as per the state is populated for the drill down. I am having issues in drill-down upto 3 level in column chart in Xcelsius 2008. I have got following data and i want that in first column with summation of annual & potential fees by category and when i click on category then it should take me second column chart showing me summation of annual & potential fees by sub-category and when i click on the subvategory then it should take me third column chart showing description.I tried but could not get desired results and checked many post on internet but have yet not found anything substantial. I am very new in creating Xcelsius dashboard. Would you mind to share the xlf file, Jim? Please email the Xcelsius and Excel sheet to fernandito75@gmail.com – Thank you!